Kung Fu San Soo (功夫散手) is a martial art based on techniques from all over China, both Northern and Southern Chinese martial arts systems. The 5 Family Fist (五家拳) is an important part of San Soo, and is commonly practiced in the Taishan region of the Guangdong province. 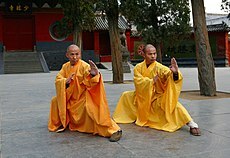 Kung Fu San Soo as taught in China has many traditional forms and isometric exercises in its training regimen. Chin Siu Dek (Jimmy H. Woo), the man responsible for bringing Kung Fu San Soo to America, did not believe in the animal styles and hence taught only the 5 family styles (蔡李何佛雄). His words were, "We fight like men, not animals." The name "Kung Fu San Soo" itself was chosen by Woo to simplify the pronunciation and meaning for American students, rather than using the complete names of the 5 families. Kung Fu San Soo originated for use in military combat and uses techniques designed to swiftly disable an attacker. Due to the fact San Soo is a practical martial art for self-defense and the techniques are intended for real fight scenarios, there are no competitions or tournaments for San Soo Kung Fu. San Soo was not created or taught as a tournament sport, but practitioners commonly incorporate forms of limited sparring. Kung Fu San Soo does not attempt to emulate the motions of animals with elaborate forms. The basic premise of San Soo is there are no rules in a fight, so the style is techniques oriented to remove a threat as quickly as possible through seizing the initiative and keeping the opponent off balance. Like many martial arts, San Soo can be used by smaller or weaker persons against larger or stronger assailants by utilizing technique and knowledge of reaction to make up for a lack of strength. Techniques in San Soo are made up of Chin Na leverages, throwing, choking, joint-locking, strangling, strikes, and quick takedowns. Targets include the eyes, nose, throat, base of the skull, neck, liver, spleen, kidneys, testicles, and knees, and for this reason, most San Soo practitioners do not engage in full contact competition/sport fighting. Techniques are commonly practiced in unrehearsed 'freestyle workout' sessions with carefully controlled contact. San Soo practitioners claim this method of training builds an automatic and flexible response in much the same way we learn language a few words at a time until we have full and versatile vocabularies. Training methods, historic interpretations, and modifications exist from school to school among the modern descendants of San Soo. San Soo also incorporates training with the use of many traditional Chinese weapons. These include the staff (5', 7' and 9'), broadsword, hooking or ripping swords, baat cham do (butterfly swords), three-section staff, tai-chi sword, knife, spear, kwon do, chas and chain. The baton, although not a traditional Chinese weapon, was a weapon that Jimmy Woo specialized in and incorporated into the art. San Soo is a distinct fighting style from the similarly named Chinese martial art San Shou. Although they share the same name in Chinese (散手 - meaning 'free hand'), context is used to differentiate between the two. First, the difference in dialect. San Shou (散手) is Mandarin (Beijing). San Sao (散手) is Cantonese (Hong Kong). San Soo (散手) is Sei-yap (or Toisanese) dialect within the Cantonese dialect, a sub-dialect if you will. The Japanese killed numerous skilled martial artists pre-World War II, and during the war. Many great fighters that were unfortunate enough to live in an area that the Japanese were occupying were killed because they were seen as a threat, and a possible leader for organizing resistance movements. So, that eliminated many talented Kung-Fu men. Then after the Cultural Revolution and the Communists took over, the same process happened again. The Communists killed anyone who they perceived as a threat. Teachers, Doctors, Scientists, and Kung-Fu practitioners. Again, anyone who might organize a resistance movement. During the 1960s, in an effort to revive the Kung-Fu martial arts in China, the government looked to any and all remaining Kung-Fu practitioners in Mainland China. They took what was useful, as well as any techniques from foreign martial arts they thought were useful, and made the Chinese Red Army San Shou (散手). This was only taught to the Army, and to the Police Forces. Then during the 1970s, that is when China started to turn San Shou (散手) into a competitive sport. In America, the best known San Shou (散手) competitor is Cung Le from San Jose, California. Chinese Red Army San Shou (散手) is closer to Kung-Fu San Soo (功夫散手); than San Shou (散手) Kickboxing. The specific or proper name of this art is Tsoi Li Ho Fut Hung. In China, many centuries ago, there were three original families that contributed information from their systems in order to create this art. They built a monastery and developed a combined defense system. These families are Tsoi, Li, and Ho. Fut was the philosophical or religious base and originally made reference to Buddha. The Hung family was added later in order to increase power, physical conditioning and dynamics. Kung Fu San Soo was brought to America by a Chin Family practitioner, Chin Siu Dek, Chan Siu Duk, or Chen Shou Jue (陳壽爵, Chen2 Shou4 Jue2), depending on the dialect. Entering the United States under the Chinese Exclusion Act, and leaving China on the eve of the Japanese Occupation, Chin Siu Dek took the name, "Jimmy Haw Woo" as a lifetime pseudonym. Most believe he was born around 1905–10. He died in Southern California on February 14, 1991, and is credited with bringing the Five Family Style (五家拳) of Tsoi Li Ho Fut Hung (蔡李何佛雄), or San Soo Kung Fu to America after learning primarily from his Great-Uncle, Chan Siu Hung, at the Hung Sing Goon school in Taishan, Guangdong Province, China . Kung Fu San Soo tradition holds that Chin Siu Dek lived and grew up just across the river from this school in the village of Sanba. Sadly, this school was later destroyed by the communists in the cultural revolution. Also, one of his classmates was Chan Siu Hung's own son, Chan Sai Mo (Chen Shi Wu [Mand]). As Jimmy H. Woo, Chin Siu Dek opened his own studio in El Monte, California to teach his family art in about 1959. ^ "亚虎娱乐导航_亚虎娱乐官网导航_亚虎娱乐安全网址". sansoomichigan.com. Archived from the original on 20 December 2016. Retrieved 3 December 2016. ^ "Real Kung Fu San Soo - About the Art". realkungfusansoo.com. Retrieved 29 January 2017. ^ "Kung Fu San Soo: Home". dapgakungfu.com. Retrieved 3 December 2016. ^ Emerson, Award Winning Flash Designer, Web Designer, Internet Producer, Terrance Emerson, Tnt. "Kung Fu San Soo Sonora - Tsoi Li Ho Fut Hung". sonorasansoo.com. Retrieved 3 December 2016. ^ "San Soo AFC - Kung Fu San Soo History from Orange and Los Angeles County's Realistic Fighting and Self Defense School. Kung Fu San Soo Video, San Soo DVD's, San Soo Books and Self Defense Training Products". sansooafc.com. Retrieved 3 December 2016. ^ "Gerald Okamura". IMDb. Retrieved 2018-02-10. ^ "Ralph JohnsonSansoo". earthwindandfire. Retrieved 2018-10-18. This page was last edited on 18 October 2018, at 20:35 (UTC).